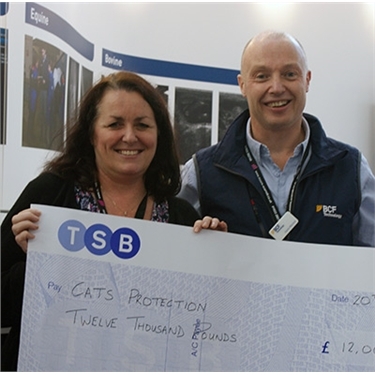 The Vet Charity Challenge team handed over £36,000 raised from the 2014 Vet Charity Challenge to the three supporting charities at the 2014 London Vet Show. This brings the total raised in the past three years by this event to over £100,000. The Vet Charity Challenge event took place on Saturday 27 September 2014 in Pewsey, Wiltshire where 47 teams from vet practices and industry overcame a series of physical and mental challenges to see who would take the winner’s trophy. Teams of four spent the day walking, running, cycling, kayaking and orienteering, along with a variety of mental tasks. The supporting charities were Cats Protection, SPANA and Hearing Dogs for Deaf People.